Beware of spoilers. Nope, I’m not giving away the ending (I’d never do that! ), but this issue is hard to review without giving away some fairly major revelations. At the beginning of the issue, we find Daredevil in the tiny prison cell we sam him being transported to at the end of Daredevil #13. Hours have passed, and Matt is noticeably affected by the lack of food, water and sleep. Waid and Samnee make sure to remind the reader of the added isolation a character like Daredevil experiences, perceiving his surroundings only through what the small breathing holes allow. His isolation ends when he is joined by new villain Beltane, Doom’s minister of finance. This is where things go from bad to worse. After having his small cell filled with a mysterious gas, Daredevil is inexplicably set free. Suddenly on the run from his captors, he’s soon about to discover the exact nature of his sentence. During his stint on Daredevil thus far, Mark Waid has managed to make Matt Murdock uniquely relatable, a character whose adventures we follow because we actually care about him and what happens to him. For this reason, I would argue that the opening few pages of Daredevil #14 are some of the scariest we’ve seen yet. What Beltane puts Daredevil through is torture. Pure and simple. Of course, like the criminal mastermind that he’s turning out to be, Beltane’s cruelest trick is of the more insidious kind. Before we cut to a scene featuring Foggy and Kirsten McDuffie – hints are dropped about what Foggy found in Matt’s desk drawer, but we’re still mostly in the dark – we’re treated to a panel that should have most readers guessing just what it is Matt is up against. Is the fruit in Latveria really as bland as Matt thinks it is or are his super-charged taste buds beginning to fail him? One brawl in an odorless flower shop later, and Daredevil starts to realize what is happening to him. I’ve seen a few commenters refer to this apparent physiological transformation as “Daredevil losing his hypersenses.” However, the reality appears to be much worse than that. He’s losing his senses. All of them. Completely. The rapid deterioration of Matt’s ability to function at all, combined with the chase to capture him, makes the second half of this issue a thrilling battle against the clock. It is extremely exciting and absolutely horrifying. The sense of desperation and urgency is communicated through the art as much as the writing and Chris Samnee does as great a job convincing us of Matt’s initial fatigue in his small prison cell as his adrenaline-fueled fight for his life in the fast-paced action scenes. Whether Daredevil is fighting in town squares or on horseback, each panel is full of energy. Kudos also to Javier Rodríguez who continues to excel on the coloring duties. What I most appreciate about the art is that it just tells the story so well. While I certainly stopped to admire the finer details on my second and third reading (I’m a big fan of Samnee’s bold, soft linework), the first time around I was too enthralled by the actual story shown on the page to be concerned with the mechanics behind the magic. And that’s exactly what you want, pure imagination unleashed. Before rounding off this review (and hey, there is already an unlettered preview of Daredevil #15 available), let’s take a moment to really think about what our poor hero might actually be going through. While Daredevil has lost his radar sense a few times – and his senses being temporarily confused is commonplace – I would argue that what Waid is putting him through here is possibly the most extreme thing that’s ever happened to Daredevil. It’s as fascinating as it is disturbing, and I can’t wait to see just how Matt will be able to handle all this psychologically. His condition seems almost like the mirror image of locked-in syndrome (in which a person is completely paralyzed and unable to speak, but fully able to take in what’s happening around him). I can’t fathom anything more traumatic. We know, from hints in the comic itself as well as interviews with Mark Waid, that Matt’s past psychological troubles are about to catch up with him (if they haven’t already), and I’m curious to see what the next few issues are going to reveal about the state of his psyche and whether what he’s now going through will have any particular impact on this process. I expect that it will and I have high expectations for what this creative team will do with these most peculiar of circumstances. I had thought about it before, but I think now I am pretty sure about what’s inside Matt’s desk drawer. And it’s completely creepy. Great review of a great issue. I love seeing DD out of New York, and this didn’t disappoint. I think Daredeil was weighed down by the crossover in issue 8, the stupidly named 10.1 issue and next crossover in 11. From issue 12 it has been back on form though and I am really looking forward to each issue. I have been a trade-waiter, but have switched to digital so get to read these reviews properly straight away now. I have enjoyed the blog for awhile Christine, but not commented before – thanks for doing it! An excellent review, Christine! 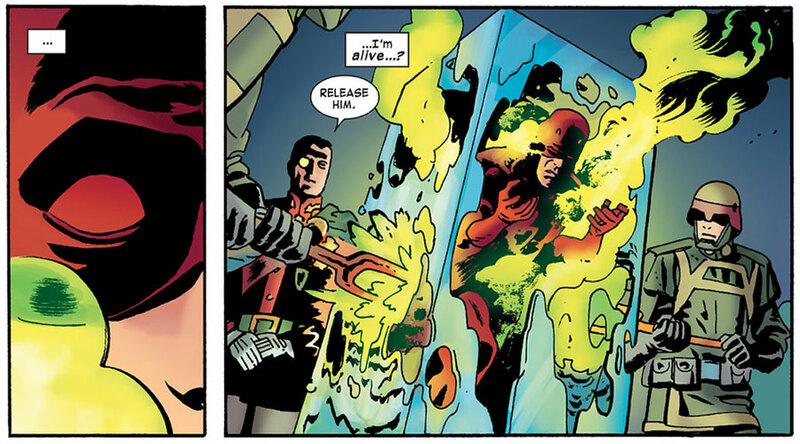 I also found Waid’s description of Matt’s imprisonment, and the loss of his senses, harrowing, not least because of the implications for the plot. I find myself wondering what Doom’s (or Beltane’s) motive for all this is. While this is a uniquely horrible punishment to give Daredevil, it seems odd that Beltane would dose Matt with the nanites, let him run, and then recapture him once Matt can’t possibly know he’s being re-imprisoned. Since the goal obviously isn’t to make Matt suffer in the usual Doomish way (Doom LOVES to make captured heroes ruminate on their fates, after all, but again, Matt’s not fully aware of his), this seems more like an experiment–like Doom is testing the nanites out on the most acute senses he can find in order to see what happens. That idea is borne out by the fact that Matt is recaptured, even though he’s now immune to the usual villainous taunting and he’ll require costly medical care to stay alive. He’s no use to Beltane et al. except as a hostage or, more likely, a test subject. Which begs the question–what ELSE is planned for those little bugs? I honestly think I’m more creeped out by the idea of Matt being an unknowing Patient Zero in some bizarre Doom plot than I am by the loss of his senses. And a senseless Daredevil is pretty darned creepy. What do you think, Christine?